The fisheries sector in the Pacific Region, and the hundreds of thousands of workers and families it supports, have been given a boost by Pacific Island Leaders meeting in Phonpei, Federated States of Micronesia, from 8-10 September. Papua New Guinea’s Prime Minister, Hon. Peter O’Neill CMG MP, said fisheries is the most important sector for any island nation and Forum Leaders are working to make the sector more fair and transparent. The Prime Minister said Forum Leaders have called for action on a number of issues that cause damage to the sector and threaten lives. “Leaders have called for greater action in dealing with Illegal Unregulated Unreported fishing and related activities that take place in our waters,” PM O’Neill said. “Illegal fishing is stealing millions of dollars in fisheries revenue, is damaging marine ecosystems and is involved in other disgusting activities such as human trafficking. “Leaders are encouraging the Pacific Islands Forum Fisheries Agency to ensure the rapid implementation of the Tokelau Arrangement. “We also urge flag states to exercise greater diligence in carrying out their flag state responsibilities and the control of nationals on vessels. “It is obvious to any observer that around the region there is corruption in the fisheries sector, and we are going to stamp this corruption out. In their deliberations in Phonpei over recent days, Leaders sough to to have a more comprehensive definition of ‘fisheries’ that would take into account more places where fish breed and live or places that have an impact on the sector. 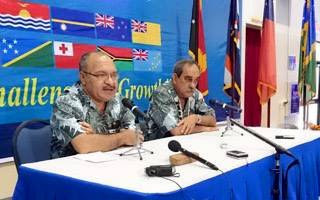 Forum Leaders also noted the positive outcomes from the final renegotiation session of the Treaty between the United States of America and Certain Pacific Island Parties. “The outcomes of discussions with the United States provide flexible yet commercially valuable arrangements for the region. In the Joint Communique, Leaders stated that they were pleased with the positive collaborative work that has been undertaken by the Forum Fisheries Agency (FFA), the Forum Secretariat, the Parties to the Nauru Agreement Office (PNAO), and the SPC, that came together as the Fisheries Task Force, to implement their decision on increasing economic returns and ensuring the sustainable management of fisheries.